There is a long history of the Black freedom movement standing with the cause of Palestinian liberation, and vice versa. 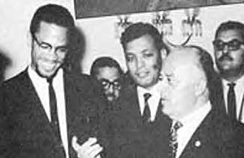 SNCC, the Black Panthers and Malcolm X all connected the Black struggle with Palestine. This solidarity continues today on many fronts. Join us for a discussion. RSVP on Facebook. Childcare provided. Sponsored by the Party for Socialism and Liberation. This event will present the real Nelson Mandela, a revolutionary fighter against oppression and exploitation, not the fairy-tale figure manufactured among US politicians and the big-business media, aiming to dilute the truth of his history and legacy. 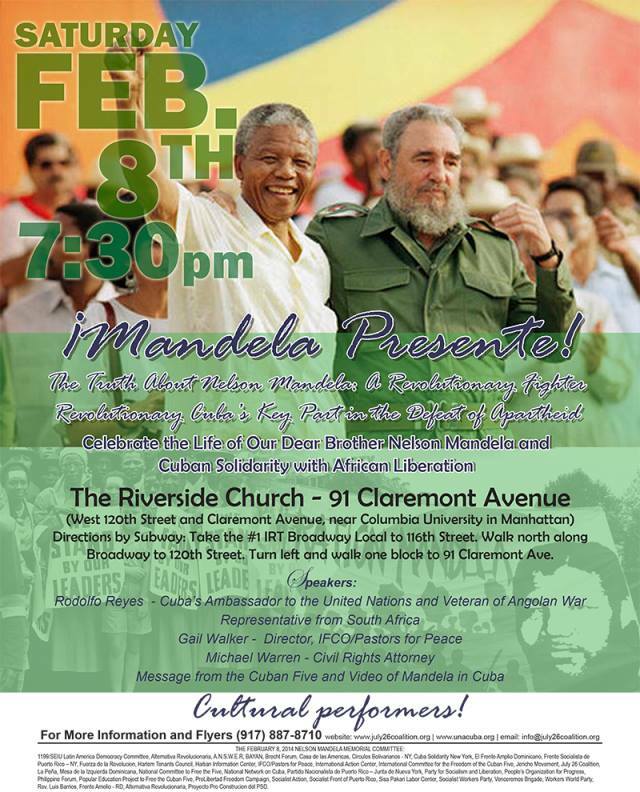 THE FEBRUARY 8, 2014 NELSON MANDELA MEMORIAL COMMITTEE includes: 1199/SEIU Latin America Democracy Committee, Alternativa Revolucionaria, A.N.S.W.E.R, BAYAN, Brecht Forum, Casa de las Americas, Circulos Bolivarianos – NY, Cuba Solidarity New York, El Frente Amplio Dominicano, Frente Socialista de Puerto Rico – NY, Fuerza de la Revolucion, Harlem Tenants Council, Haitian Information Center, IFCO/Pastors for Peace, International Action Center, International Committee for the Freedom of the Cuban Five, Jericho Movement, July 26 Coalition, La Peña, Mesa de la Izquierda Dominicana, National Committee to Free the Five, National Network on Cuba, Partido Nacionalista de Puerto Rico – Junta de Nueva York, Party for Socialism and Liberation, People’s Organization for Progress, Philippine Forum, Popular Education Project to Free the Cuban Five, ProLibertad Freedom Campaign, Socialist Action, Socialist Front of Puerto Rico, Sisa Pakari Labor Center, Socialist Workers Party, Venceremos Brigade, Workers World Party, Rev. Luis Barrios, Frente Amelio – RD, Alternativa Revolucionaria, Proyecto Pro Construcion del PSD. 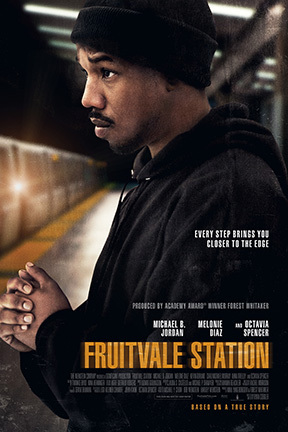 This important and award-winning film is based on the true story of the police murder of Oscar Grant. It highlights the racism and police brutality that is plaguing oppressed communities nationwide. Come learn more about what happened in Oakland California five years ago and discuss what we can do to fight back. Join us! Join us for a night of Hip Hop, Dance, Poetry and Community Empowerment. The ANSWER Coalition (Act Now to Stop War and End Racism) is working to build an anti-racist, anti-war and social justice movement through grassroots activism and community organizing. We are fundraising essentially to keep doing what we do! Fresh Food and Drinks will be Available. Multiple Raffle Drawings throughout the night. Make an advanced ticket purchase now and get a free raffle ticket! 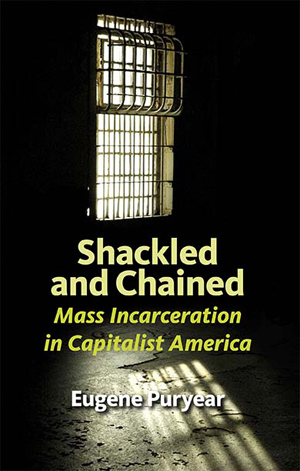 Our featured speaker, Eugene Puryear, author of the recently published Shackled and Chained, Mass Incarceration in Capitalist America, will speak about the racism, historical foundations, and political objectives behind the U.S. prison system, which incarcerates people at a far higher rate than any country in the world. Also presenting: a representative of Asociación Ñeta Pro-Inmate Rights and Rukia Lumumba, member of Malcolm X Grassroots Movement, former Youth Director of Center of Community Alternatives, and Youth Director of CASES (Center for Alternative Sentencing and Employment Services). Contact ANSWER at 212-694-8720 for more information!